Far too many lives are cut short or changed forever by gun violence every day in America. On Wednesday, right as the City Council voted to study how guns used in crimes make it onto LA's streets, we heard the chilling reports about another fatal shooting, this one on UCLA's campus. As an editorial in today's Washington Post points out, the UCLA shooting marks the 186th U.S. school shooting since the 2012 massacre at Sandy Hook. That tragic number is outrageous and completely unacceptable. I hope you agree with me that we cannot sit back and endure the status quo any longer. That's why I'm working so hard with my City Council colleagues in Los Angeles on this issue. In the last year alone, LA has passed my laws banning the possession of large-capacity magazines and mandating safe storage of firearms at home. We have also required electronic reporting of ammunition sales. My latest motion continues LA's leadership on this life and death issue. According to the Bureau of Alcohol, Tobacco, Firearms and Explosives, just five percent of gun dealers sell 90 percent of all crime guns nationwide. These "bad apple" gun dealers skirt the law to sell guns to criminals, domestic abusers and fugitives. My motion, approved 13-0 by the City Council, instructs the Los Angeles Police Department to work with Crime Gun Solutions, an independent research organization, to conduct a study that will identify the sources of the recovered crime guns in the and determine whether or not they come from "bad apple" gun dealers. The measure was inspired by the Brady Campaign and Center to Prevent Gun Violence's "Stop Bad Apple Gun Dealers" campaign, which spearheaded a similar study in Chicago, the first U.S. city to study the link between gun dealers and crime guns. Chicago's study identified four gun dealers who provided a disproportionate amount of the crime guns recovered on its streets. Since that time, one of those dealers has agreed to reforms, and there are ongoing efforts at the state and local levels to improve other policies, programs and practices to further reduce the flow of crime guns. I am confident that LA's study will help us identify the problem and lead to policy solutions that will do even more to keep the public safe from gun violence. Read my motion here. 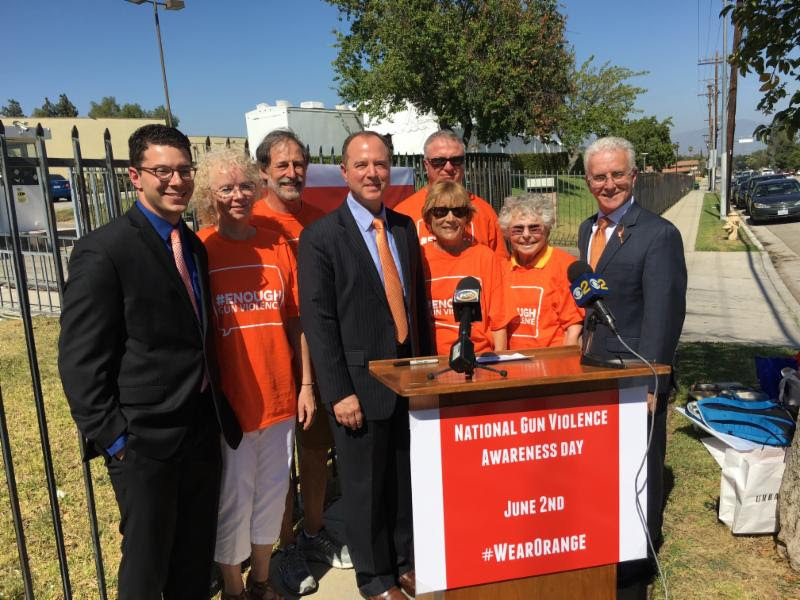 Also this week, LA recognized June 2 as National Gun Violence Awareness Day. City officials and people across the city wore orange that day to shine a light on gun violence and to honor the individuals whose lives were lost. We also turned City Hall orange that night, lighting the building for people near and far to see. by wearing orange -- the color hunters wear in the woods to protect themselves and others and a color that reflects the value of human life. In January 2013, Hadiya, a 15-year-old student and drum majorette, had just enjoyed the best week of her life after marching in President Obama's second inauguration parade. However, just one week later, her short life was over. Hadiya was fatally shot during a gang drive-by, while taking shelter during a rainstorm. No one can bring back Hadiya, just like no one can bring back the tens of thousands of gun violence victims each year. But we can try to prevent more deaths in the future. No one should be killed when taking shelter from inclement weather. No one should fear gun violence when seeing a movie at a theater. No one should have to hide from a shooter at a church or other place of worship. No one should wonder if they will be targeted by a gunman at school. Enough is enough! Although Congress has utterly failed to act to protect Americans from gun violence, I pledge to make sure we in Los Angeles keep doing our part. The bloodshed and carnage has got to end. Our communities deserve to be safe and our children deserve to inherit a better future. I hope you will join me in this endeavor. Please contact me if you want to get involved in the growing movement to stop gun violence:paul.krekorian@lacity.org or 213-473-7002.